Our Curlew population has expanded! 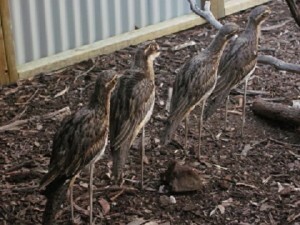 Just recently we’ve been lucky enough to be given some more Bush Stone-curlews for our breeding program. This latest group of four birds came from the Hall’s Gap Zoo, and are only a few months old. 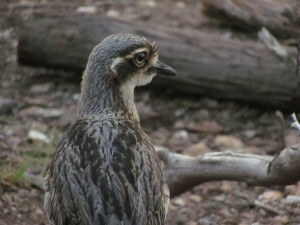 They’ve settled in well but we can’t help noticing that, as with many other types of animals, these birds have quite different behaviour patterns to the first pair of birds that we are holding. These four “younguns” tag around together a lot, and even lined up army-style for the photo! They really don’t seem to be bothered about humans being in their enclosure, and are quite happy to pose for a “close-up” photo. They enjoy stretching their wings and will often have a bit of a short flight from one end of the cage to the other – that’s very impressive! We’ll try to capture that action in a later camera session. Posted by Jenny and Frank.